The greater Everglades ecosystem encompasses 1/3 of the State of Florida , historically encompassing nearly 9 million acres from its headwaters near Orlando through the Kissimmee Chain of Lakes and River into Lake Okeechobee and down to Florida Bay and the Florida Keys. More than 100 years of digging canals and building levees to drain the swamp and manage flooding for agriculture and development have drained natural wetlands and destroyed the flow of the River of Grass. 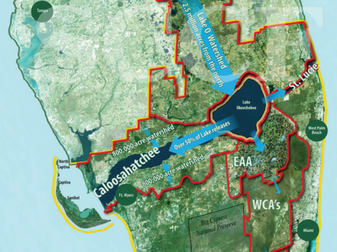 Today, less than half of the original 3 million aces of the Everglades, south of Lake Okeechobee remain. Florida has lost healthy wetlands that stored and cleaned excess water for use during Florida’s dry season and now struggles with alternating years of costly water shortages and water excesses that threaten the Everglades, coastal estuaries, communities and Florida Bay. Meanwhile pollution and stormwater runoff from agriculture and urban development has disrupted the natural balance and health of ecosystems and the fish, birds, reptiles and mammals that inhabit them. Our local water conditions and quality are influenced by the operation and function of the greater Everglades ecosystem. We are actively engaged with restoration planning, contributing a west coast perspective, working to build consensus on solutions, providing public comment and educating our members and community through public outreach and presentations. The Everglades is a UNESCO World Heritage site listed as in danger. It is home to 67 threatened and endangered species. There is only one Everglades in the world. Protecting and restoring this national treasure will benefit our local conditions and economic engine of Florida.